Eastern Turkmenistan for centuries formed part of the Persian province of Khurasan; in medieval times Merv (today known as Mary) was one of the great cities of the Islamic world and an important stop on the Silk Road. Annexed by Russia between 1865 and 1885, Turkmenistan became a Soviet republic in 1924. It achieved independence upon the dissolution of the USSR in 1991. Extensive hydrocarbon/natural gas reserves could prove a boon to this underdeveloped country if extraction and delivery projects were to be expanded. The Turkmenistan Government is actively seeking to develop alternative petroleum transportation routes to break Russia's pipeline monopoly. President for Life Saparmurat NYYAZOW died in December 2006, and Turkmenistan held its first multi-candidate presidential electoral process in February 2007. Gurbanguly BERDIMUHAMEDOW, a vice premier under NYYAZOW, emerged as the country's new president. For silver and base metal coins of Turkmenistan, please look at our original Chard Coins website. 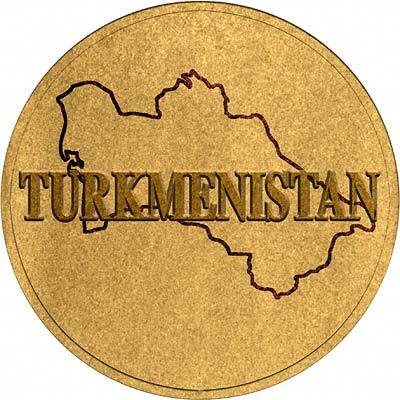 We make an active market in almost all world coins, gold or otherwise, including Turkmenistan gold coins. If you have any of these coins to sell, please contact us, or post them to us for appraisal and offer.